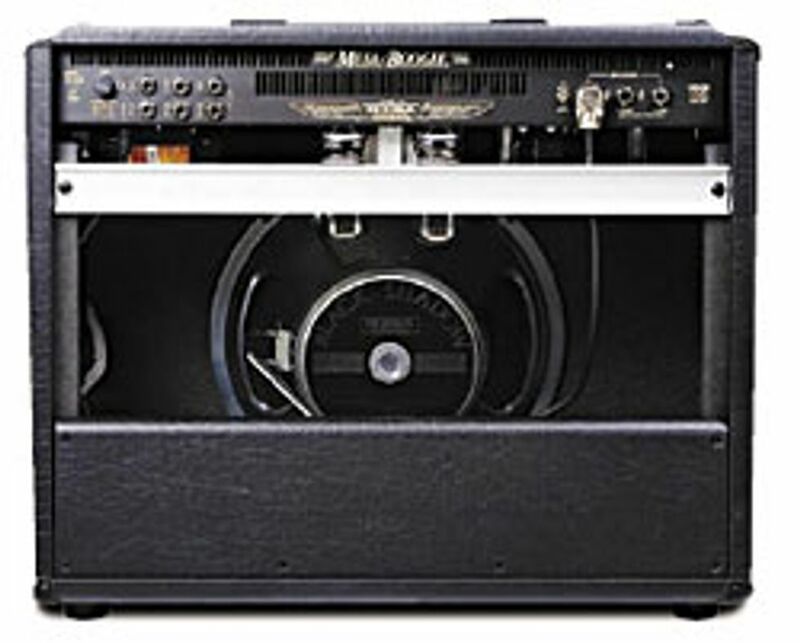 Mesa Boogie recently added the Express series of amplifiers to its vast line of tone generators. The Express is offered up in two formats to meet the musical tastes of players of any genre. The 5:25 features two EL84 power tubes and a smaller bottle design that lends itself to the early breakup and warmth heard in many vintage British amplifiers. Our review model, the 5:50, features a duet of 6L6 power tubes. If you’re not familiar with 6L6s, they lend themselves to nice, sparkling clean tones with a distinct, rich bottom end (think early Fender). The 6L6 also comes across as smooth in high gain situations and is definitely one of my personal favorites. 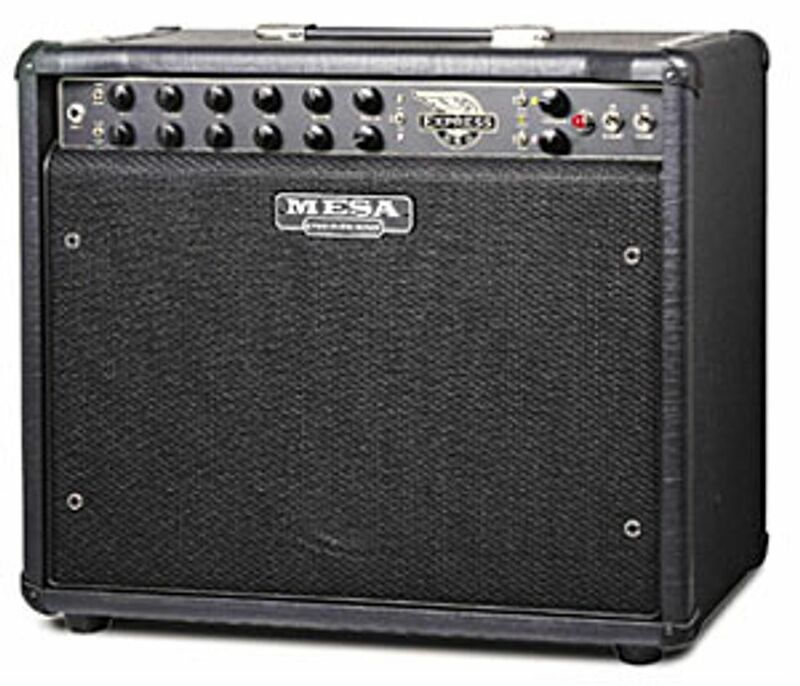 The Express features Mesa’s Duo-Class power switching circuit. The switching circuit allows the player to choose between Class A/B at 50 watts or Class A at five watts. Peter Stroud, musical director and guitarist for Sheryl Crow, PG columnist and tone chaser extraordinaire, shed some light on this subject and put it into terms that are easy to understand: “When the amplifier is in Class A mode, it is being pushed much harder – think of it as the power section on ten, full throttle – providing more break-up, midrange and sag, which is great for that vintage, bluesy rock vibe. In A/B mode the power section provides much more headroom, producing tighter low-end sounds and a more prominent top-end.” It’s a great design, and Mesa is well-known for inventing this dual class power section. Out of the gate, the price of admission on the Express 5:50 is justified by its incredible flexibility and ease of navigation. The 5:50 offers the player two separate channels, each with two modes and independent EQ. Channel 1 provides Clean and Crunch while Channel 2 provides Blues and Burn. Other features include a tube-driven reverb and separate, footswitchable Contour knobs for each channel. For my test drive, I used a Gibson Les Paul BFG loaded with a Seymour Duncan Custom Shop ‘78 model humbucker in the bridge position and the stock P-90 up front. I started with Channel 1’s clean setting to get comfortable. Each channel provides six knobs: Gain, Treble, Mid, Bass, Reverb and Master Volume. In A/B mode I was able to get some very pleasing clean tones with decent headroom. When I switched down to five watts, the amp was absolutely beautiful and really opened up, becoming very expressive and making even order harmonics more prevalent – these are the natural harmonics that make an amp sound great, giving chords and single notes rich, secondary overtones. What’s killer about this channel is when it’s pushed, by cranking up the gain and rolling up your guitar’s volume knob, you’ll hear some awesome, fuzzified, distorted clipping sounds. Roll down your guitar’s volume knob and you’re instantly back to clean. The crunch setting on Channel 1 was most impressive to me in full power A/B mode. I was able to get some thick, bold distortion sounds. I first thought of this amp as a low-powered vintage affair, but I suddenly found myself in a dropped tuning, ripping out aggressive higher-gain rhythms. The low-end wasn’t extremely tight – instead it was a little more organic and somewhat spongy. This seems to be a signature quality in most Boogie amps – some folks will like it, some won’t. I was really knocked out by the amp’s versatility when I started messing with the Contour. The Contour knob allows the player to V-scoop the EQ to their heart’s content in any channel, and by scooping just past the point of the amp’s standard midrange voice, I found fluid lead tones with plenty of sustain. Before moving on to Channel 2, I experimented with the tube-driven reverb. I’m generally not big on using reverb, but this had a natural, organic feel. You could certainly tell that there was a tube behind it and it was sweet and transparent when properly adjusted. You can adjust its level with the knob on the faceplate and bypass or engage it with the included Express 5:50 footswitch. Although Channel 2 Blues was intended for moderate gain, I found it to be my favorite tone center for full-on, smooth distortion rhythm and lead work. This channel picks up where Channel 1 leaves off; great blues tones are to be found with the Contour disengaged in Class A mode. Burn is over the top, just as advertised. By placing the Contour knob in an extreme setting with the amp in full-power Class A/B mode, this channel was capable of venturing into Metallica, Dimebag or similar territory with no problems. The Express 5:50 speaks in a variety of voices and sounds great doing it. The low-powered, old school tones were extremely convincing and the A/B full-powered gain sounds were huge. You could spend hours dialing in variations, yet the amp still feels simple and thoughtfully designed. Its variable power makes it perfect for home recording situations, but the amp will shine in studio and live applications as well. If you want to cover a lot of ground with speed, ease and quality tone, this is a winner. Our expert has stated his case, now we want to hear yours. Log on and share your comments and ratings.